OSAKA - Takeda Pharmaceutical Co. won approval from shareholders Wednesday for its plan to purchase Irish drugmaker Shire PLC in what would be the biggest-ever overseas acquisition by a Japanese company. 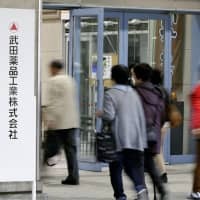 Although some founding family members and former employees opposed the purchase at an extraordinary meeting, at least 88 percent of Takeda shareholders gave the nod to a plan to buy the Dublin-based company to create the world’s ninth-largest drugmaker with combined sales of about ¥2.8 trillion ($24.8 billion). “We are delighted that our shareholders have given their strong support to our acquisition of Shire,” Takeda CEO Christophe Weber said in a statement. Takeda has already won approval from antitrust regulators in relevant countries including Japan, China and the United States. The drugmaker aims to complete the purchase by early January. The approval came in the face of opposition from a group of shareholders who had sought to vote down the takeover plan, since their initial attempt to do so was rejected at a general shareholders’ meeting in June. They believe the deal is too costly to pursue. At the meeting in Osaka, an opponent of the takeover asked, “Isn’t the acquisition a gamble?” But Weber said the deal would enable Takeda to strengthen its spending on research and development and gain competitiveness in the pharmaceutical industry. Opponents include founding family members Kunio Takeda and Kazuhisa Takeda, a former chairman and former director of the country’s largest drugmaker, respectively. 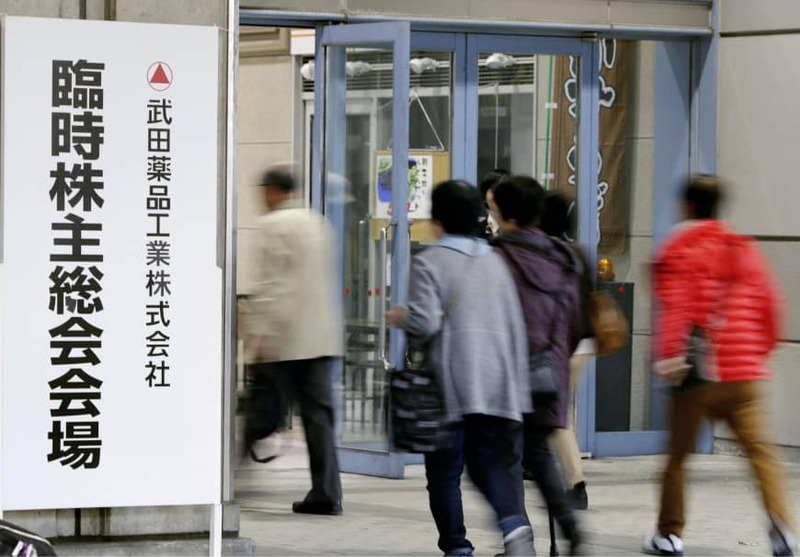 The merger is expected to increase Takeda’s net interest-bearing debt to more than ¥5 trillion, about 10 times the amount before the acquisition. Opponents of the Shire acquisition were concerned about the hefty debt and the reduction in earnings per share that will result from the new share issuance to finance the deal. Takeda is looking to add London-listed Shire’s know-how in rare diseases including hemophilia to Takeda’s core businesses of oncology, neuroscience and gastroenterology. More than 60 percent of Shire’s sales come from the United States. Analysts have said the buyout would be a smart move by Takeda as it looks to diversify and could pay off in the long term, but they have also raised concerns that the Japanese firm could be overextending itself financially. Takeda plans to finance the £46 billion (¥6.6 trillion) buyout through issuing new shares in exchange for Shire stock, bank loans and bond issuance. “The company averted the worst-case scenario in which opposition to the deal wins and throws its business planning into a mess,” said Makoto Sengoku, market analyst at Tokai Tokyo Research Institute. But Sengoku noted the price was still down more than 30 percent from about ¥6,500 at the start of the year, as investors worried over a dilution of the stock’s value due to the planned issuance of new shares. “From here, market players will be watching details of the deal, including exactly how many shares will be issued,” he said. Japanese firms in particular are facing pressure domestically as the government tries to cut prices of many branded drugs and increase the focus on cheaper generics to curb health spending as the population ages. In 2011 it took over Swiss rival Nycomed for €9.6 billion ($13.6 billion at the time).